Handing over the keys today to the new $310,000 Class 2 pumper to the Warialda Fire & Rescue Station, retained firefighter Grant Robinson, left, Gwydir Shire Mayor John Coulton, Northern Tablelands MP Adam Marshall, Station Captain Colin Cuell and Zone Commander Superintendent Stephen Hirst. FIRE protection and emergency response in Warialda has received a huge boost today with the delivery of a new purpose built $310,000 fire truck to the Warialda Fire and Rescue Station. Northern Tablelands MP Adam Marshall was joined this morning by Gwydir Shire Mayor John Coulton at the station to hand over the keys to the new Mercedes Benz Class 2 fire pumper to Station Captain Colin Cuell. This replaces a 15-year-old Isuzu truck. “This pumper has the very latest equipment and technology to increase the capacity of local Fire & Rescue NSW firefighters to deal with fires, accidents, chemical spills and other emergencies,” Mr Marshall said. “It’s much faster than the old truck and has a much larger cabin than previous vehicles, providing a greater level of comfort and safety for firefighters. “The rear of the truck has also been remounted and modified to provide more room for equipment. Mr Marshall said the Fire & Rescue NSW continued to provide its firefighters with modern and safe vehicles for their vital work in protecting families and property. “The statewide fleet is made up of more than 650 fire engines and rescue vehicles across NSW and the priority is to ensure that firefighters have the best vehicles available to them to enable to the do their jobs effectively and safely,” he said. 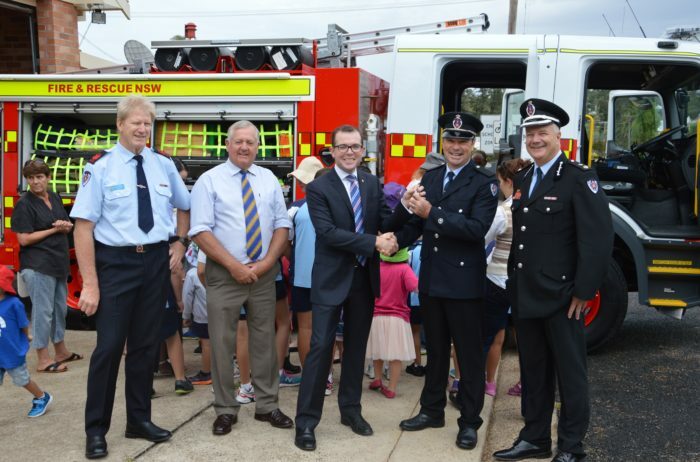 Students and staff from Warialda Preschool and St Joseph’s Primary School were also at the station to inspect the new pumper and were given a demonstration of the fire hoses, lights and sirens on the new vehicle. Mr Marshall said Warialda firefighters, led by Captain Colin Cuell and Deputy Captain Shane Turner, did a tremendous job responding to fires, rescue incidents and other emergencies as well as actively promoting fire safety in the community.